Rather than describing a style of lighting or a theory of design, PAR lighting refers to lighting that uses one of the most commonly found and inexpensive theatrical lighting instruments: the PAR, also called a PAR can. PAR lighting instruments are used in a variety of applications, including the entertainment, architectural and aviation industries. In general, PAR lighting produces bright light that travels well over distance but offers little control. PAR stands for parabolic aluminum reflector, which is the primary component of a PAR lamp. Like a household outdoor flood light, a PAR lamp is made up of a reflector, lamp and lens sealed together in a single unit. This unit is placed into a housing, known as a can, that contains a socket the lamp plugs into, a metal cylinder that helps aim the light, and a cord that terminates in a plug that can be used in a dimmable or nondimmable electrical system. PARs come in different sizes, with the larger sizes able to handle higher wattage lamps. The smallest PARs are PAR-16 (rare) and PAR-20 fixtures, which are often used for retail accent lighting because they are tiny enough to fit into window displays. The largest instruments are PAR-64s, which are most commonly used in rock concert lighting and theatrical applications and frequently run at 1000 watts. PAR-56s are sometimes used as aircraft landing strip lights. 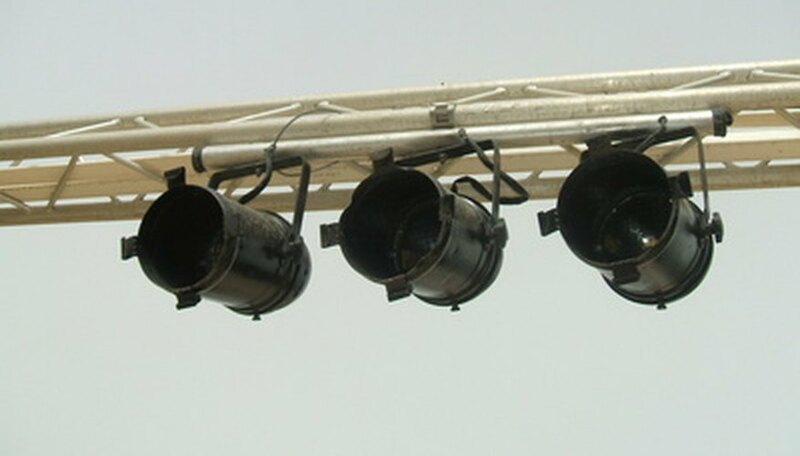 The middle sizes of PARs (36 and 56) are often used for nightclub stages and may be used in the film industry when a strong, uncontrolled light is needed. Due to the parabolic shape of the reflector, PAR lights project a roughly oval beam of light with soft edges. The lens of a PAR controls how far the light spreads out in this oval pattern (known as "beam spread"). Common lens designations are "very narrow," "narrow," "medium" and "wide," with the texture pattern or frosting on the lens producing a broader beam depending on how heavy it is. Beyond the lens characteristics, light from a PAR cannot be controlled without use of accessories such as a "barn door" assembly, which features metal shutters that clip to the front of the light and are positioned to block portions of the beam. PAR instruments produce a light that is commonly called "punchy" because it maintains its intensity well over distances. Color filters--commonly known as gels--are often placed in front of PARs to modify the color of the light, and due to their punch, PARs can produce deep, saturated colors without losing as much intensity as other theatrical lighting instruments. The quality of the color depends on the color temperature of the lamp within the PAR; halogen lamps produce a whiter light with less color alteration than tungsten lamps. Since the 1990s, a few lighting companies have modified the classic PAR to produce lights that feature the lamp, reflector and lens as separate pieces. With these PARs, you only have to swap lenses instead of entire lamp assemblies, to change the beam spread. Other developments include PAR lamps that use LED lighting to produce a clean white light or various colors of light. Multiple LEDs wired into the same assembly offer color-changing abilities within the instrument.